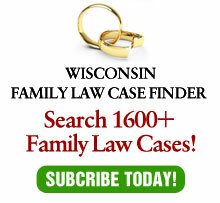 In my last post, I referenced the new Wisconsin Supreme Court decision in Meister v. Meister, 2016 WI 22 (2016) where the court reversed the Court of Appeals for affirming the trial court denial of grandparent visitation. I’ll be commenting on some of the technical law involved in my column for the State Bar of Wisconsin next month. But for this blog, I would like to make a few observations and personal comments. The effect of this decision may very well to be to greatly expand the availability of grandparent visitation in Wisconsin. While as a grandparent myself (2x! ), I have great empathy for any grandparent who is denied – or even limited – access to their grandchildren, the SC may have missed the forest due to trees in this decision. The trees is the statutory provisions which they analyzed,probably correctly. But, there is an overriding policy interest involved which I think SCOTUS got correct in Troxel v. Granville, and Wisconsin SC seems to have missed in Meister. That interest is the right of fit parents to be able to raise their children without interference from the government. In Troxel, the right of fit parents seems to trump the right of grandparents. In Meister, the Wisconsin court spends the first 23 pages of the decision dissecting the statute. I am not challenging their interpretation of the statute. But, they spend just a bit more than three pages discussing the application of Troxel. And that is a shame. It doesn’t matter what the statute says if the effect is detrimental to children and violates constitutional rights. And I’m worried that will exactly be the effect of this case. First, as I’ve written many times in my columns, litigation is inherently bad for children. Therefore, any law which encourages litigation over them is detrimental to them. Second, the constitutional rights of fit parents to be free of court supervision finds support long before Troxel (and in Troxel). Consider, for example, a situation where there are two sets of grandparents, both sets or divorce and remarried and all four sets want court ordered time with the grandchildren. Beside the litigation and the cost (which should be enough to discourage such an event in and of itself), imagine if they were successful. There may never be a weekend left for an intact family. A likely event? N0. But the Wisconsin SC seems to think that children will be protected by the trial courts treating their best interests trumping any other rights. The problems is that by the time the court gets to that decision, the harm will be done by the litigation itself. This is not a unique position by this court. In issues such as prohibiting contingent placement orders and refusing to honor stipulations freezing child support, the court fails to see the harm to children created by litigation itself. As I’ve suggested before, maybe the court needs to talk to some children.